“Greenland makes no sense,” writes author Mitchell Zuckoff in Frozen in Time. For one thing, it’s not green at all. More than 80 percent of Greenland is buried in ice. For centuries, the massive island has remained largely empty. During World War II, however, this ice-filled bowl surrounded by drifting glaciers became an important field of operations. The United States established bases there to protect the island from the Germans because whoever controlled Greenland could obtain valuable early indications of weather patterns in Europe as well as a mineral used in the construction of warplanes. Greenland was important, but its climate made it dangerous. Flying across the island was sometimes described as “flying in milk,” and if a plane went down, rescue was difficult. This book chronicles the failed rescue attempts that resulted from the November 1942 crash of a cargo plane on a routine mission from Reykjavík to a U.S. base in Greenland. A B-17 bomber en route to England that was reassigned to the rescue mission crashed just a few days later. Then, a Grumman Duck that found and rescued some of the men from the B-17 became lost in a storm. In 2012, Zuckoff took part in a mission to find that lost amphibious plane. The story Zuckoff writes alternates between that of the men lost in the frozen Arctic and that of the modern-day searchers. It’s evident from the start that some of the lost men will survive—the level of detail in the narrative requires access to some firsthand stories—but Zuckoff carefully avoids revealing who will make it and when they will be rescued. The hidden crevasses and shifting glaciers keep the men in constant danger of falling miles into the ice—far beyond any hope of rescue. Drops of food could keep them from starving, but those life-saving packages might themselves fall into crevasses. Fresh clothes and dry socks are helpful, but no amount of additional clothing could completely protect them from the long-term damage of frostbite. And even if their physical needs are taken care of, being isolated for months with so little control of their own fate puts a near-impossible mental strain on these men. When compared with the harrowing and intense tale of the 1940s crash survivors, the present-day story seems like a distraction, particularly early on when most of the chapters focus on the quest for funds. It’s hard to get excited about meetings and paperwork when the other chapters describe men whose feet are literally getting frozen off. Zuckoff wisely spends more time on the historical story in the first half of the book, only gradually shifting focus to the more recent story. 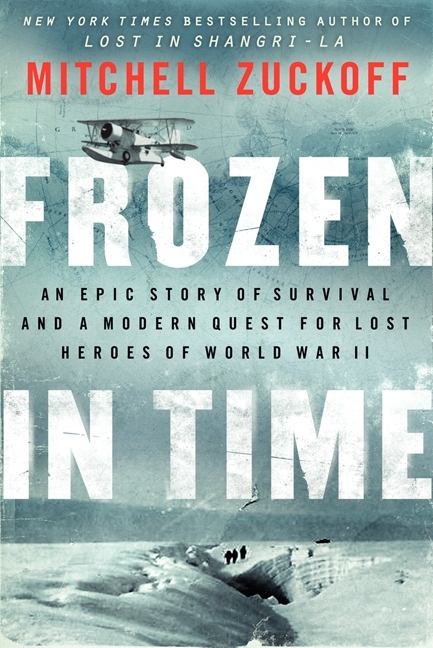 When the more recent story moves onto the ice, it gets more exciting, although, as dangerous as the quest is, it doesn’t have the life-or-death stakes that the men in the 1940s faced. But Zuckoff holds back just enough about the results of the quest to keep readers in suspense about its outcome. I liked Zuckoff’s previous book, Lost in Shangri-La, quite a lot, and, aside from the sometime tedium of the present-day narrative, I think I enjoyed this even more. Cold-weather survival stories get to me, and this is a good one. Been looking forward to reading this one ever since I seen it on Goodreads. It has been getting a lot of good buzz, which is nice to see when it’s a good book. I still haven’t read Lost in Shangri-La, which I’ve been meaning to get to for ages. Now I’ll have to add this to my list too; I’m a sucker for anything that takes place in extremely cold climates. I don’t know what it is about cold-weather survival that gets to me, but it does. I think reading reviews of this is as far as I’m going to get! Never got to Lost in Shangri-La either, although the author gave a great talk about it at a library conference I attended last year. I know what you mean–there are too many worthwhile books to read! If you get a chance to hear him speak about this book, you should try to. He was more personally involved in this story, since he went on the search for the Grumman Duck, so I’m sure he’d have some fascinating details and updates to share. I know what you mean about the appeal of cold weather survival stories. I think it explain the appeal of Nordic Noir, too.